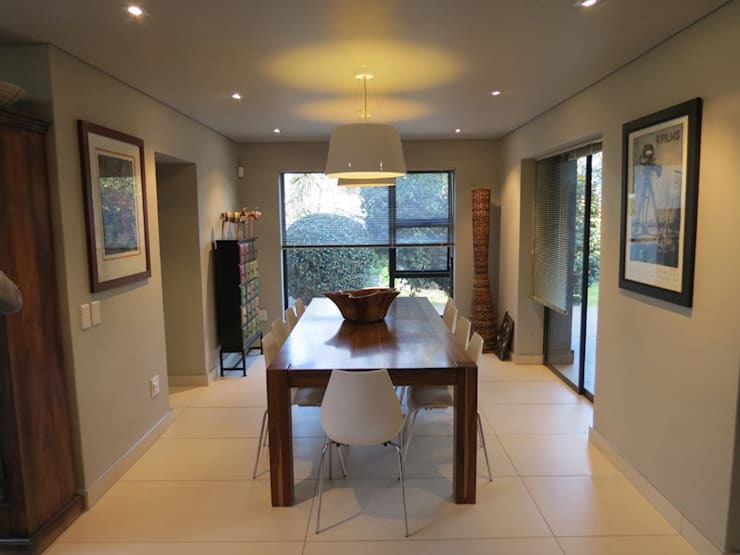 Bedfordview architect professionals, Spiro Couyadis, know how to take a gorgeous home and make it even more modern, chic and stylish. 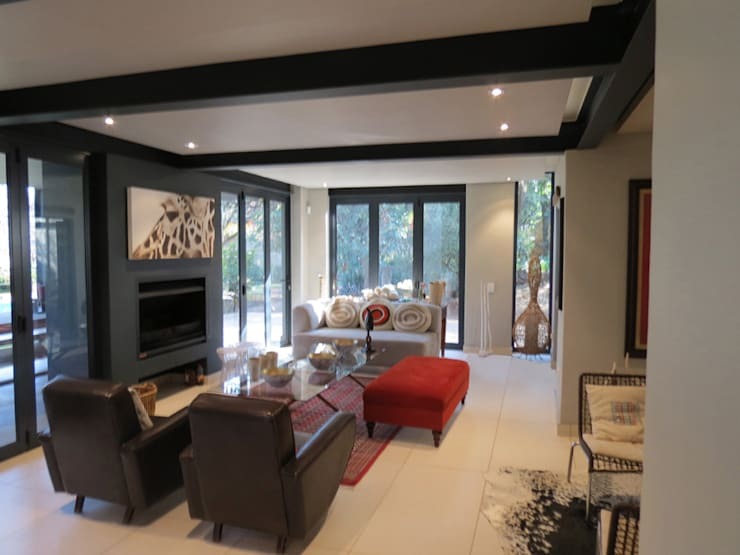 We will show you what this Bedfordview home looked like before the designers intervened and you'll see how they've revolutionised it. This design will also reveal to you how you can make some changes here and there TO completely transform the look and feel of your home. In this image, we can see how the designers have created a very neutral and earthy look and feel throughout the facade. 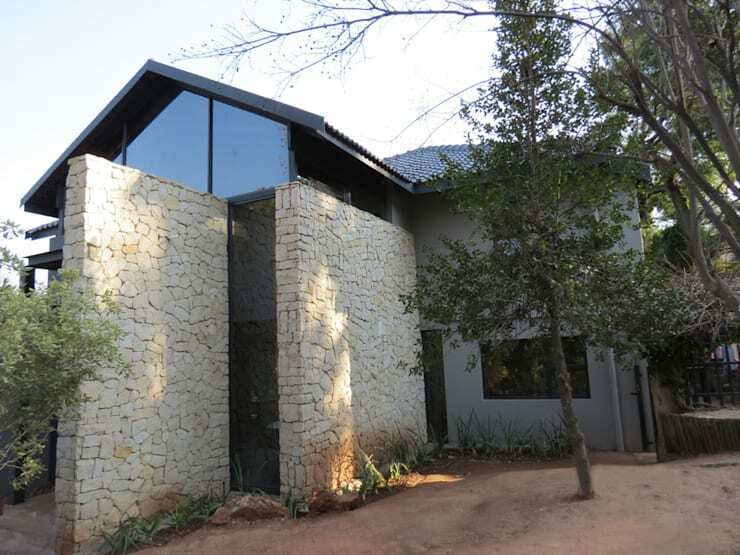 The smooth grey plastered walls work in harmony with the rough stone facade. These different textures work beautifully with one another. This allows the home to integrate into the lush garden. The facade is also interspersed with glass, which creates a wonderful transition between the interior and exterior spaces. At the front of the house, the glass creates quite a dramatic look and feel. Yet, the privacy of the family hasn't been compromised on. The home before the designers intervened was homely and quaint with its white walls and green roof. However, there was nothing modern or trendy about it. It looks like millions of other houses that you drive past every single day! Yet we can also see in this image how the designers had a wonderful base to work with! The garden and property where this home is based is absolutely extraordinary. The colourful plants, trees and flowers naturally enhance the facade! The home before the renovation was sweet and charming with a slight country look and feel, but it was also quite old-fashioned. The green shading over the windows sticks out like a sore thumb and looks like it comes out of the seventies! We can also see how the wrap-around patio is detailed with Victorian-like finishes. While this is sweet, it's not very chic or savvy. Now this is a modern and trendy home! The designers have scrapped the outdated finishes and the Victorian touches, instead opting for clean lines and cutting-edge architecture. The neutral tones are very modern and sophisticated, creating a wonderfully elegant look and feel. We can see in this design how the interior spaces spill out onto the terrace and balcony, visually and physically expanding the living area. 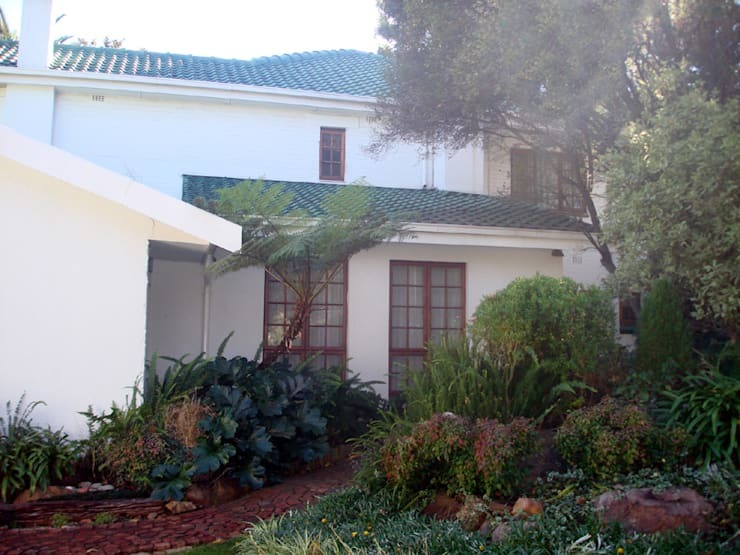 This allows for optimal utilisation of the beautiful garden and fresh air as well as the South African summers. 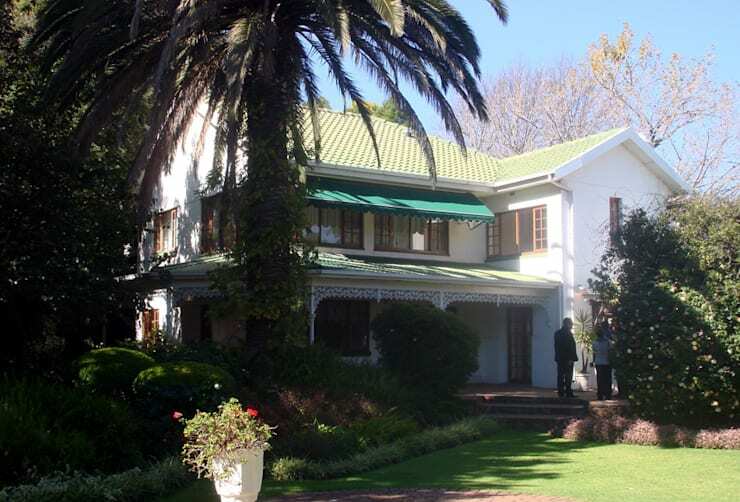 If you like this new and fresh look, you'll love this: Joburg house that's living glamorously. The new interior is just as impressive as the exterior. In the living room, we can see how the designers have used neutral tones including grey, beige and white, while adding a touch of red for vibrancy and personality. The animal artwork adds to the charm! We also love the beautiful fireplace, which adds warmth and homeliness to the living area. This is great for a South African winter. The dining room is a very cosy little nook, where natural light flows into the space through the large glass windows and doors. The large wooden dining room table and white dining room chairs are subtle yet elegant. The lighting in this space creates a wonderful ambiance. The lampshades hang from the ceiling, allowing the diners to see what the are eating while providing this room with a soft glow. We can also see how pieces of artwork and decor items have been carefully selected, enhancing this room without overwhelming it. 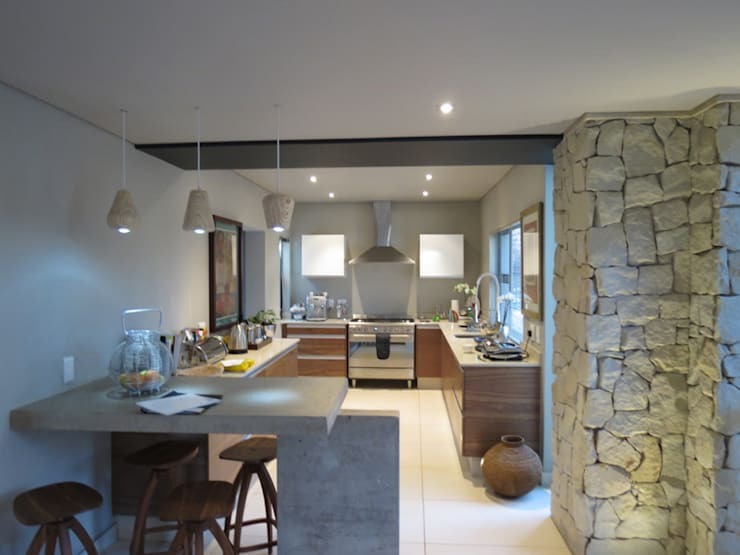 We end off our tour in the kitchen, where a stone facade brings a beautiful earthy connection to the interior space. It also features sleek and tech-savvy appliances, wooden cabinets and a little breakfast bar in the corner of the kitchen. This is the perfect kitchen for a family, with plenty of space for cooking and baking. The little breakfast bar is a wonderful little nook where more casual meals can take place. It also provides a little spot for catching up over coffee or a glass of wine! 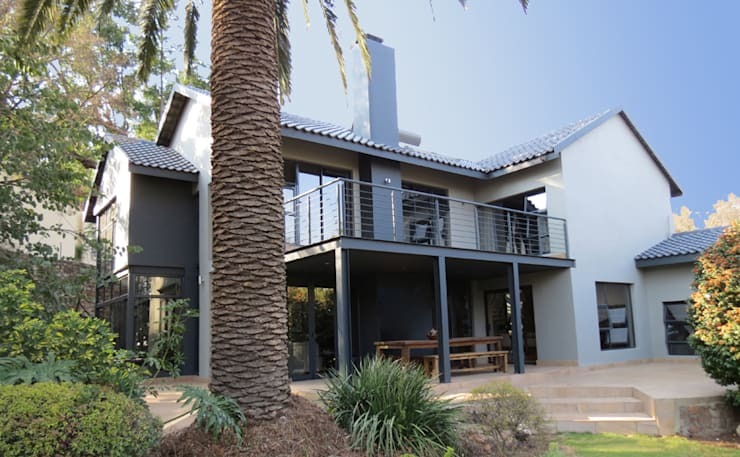 What do you think of this new and improved Joburg home?